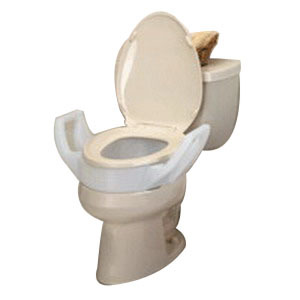 Mabis DMI Healthcare Elongated Toilet Seat Riser with Arms, Weight Capacity: 300 lb, Weight: Less Than 4 lb, Arm Height: 7-1/4" From Rim Of Bowl, Width Between Arms: 19"
Durable and easy-to-clean, this toilet seat riser uses the existing toilet seat and lid. Large molded arms for security and support. Mounting bolts and easy to follow instructions included. For elongated toilets, with a seat more than 16" long.